Born in the illustrious family lineage of mudhaliyANdAn (who is called yathirAja pAdhukA – the sandals of the lotus feet of emperumAnAr), as the son of dhEvarAja thOzhappar and the elder brother of kOil kandhAdai appan, he was named varadha nArAyaNan by his parents. He goes on to become one of the dearest disciples and ashta dig gajas (eight main personalities/disciples to propagate the sath sampradhAyam) of maNavALa mAmunigaL. kOil aNNan (as popularly known) was living in srIrangam with many sishyas. At that time, azhagiya maNavALa perumAL nAyanAr (mAmunigaL in gruhasthAsramam) arrives at srIrangam and was greatly welcomed by srI ranganAthan and his kainkaryapararars (servitors). 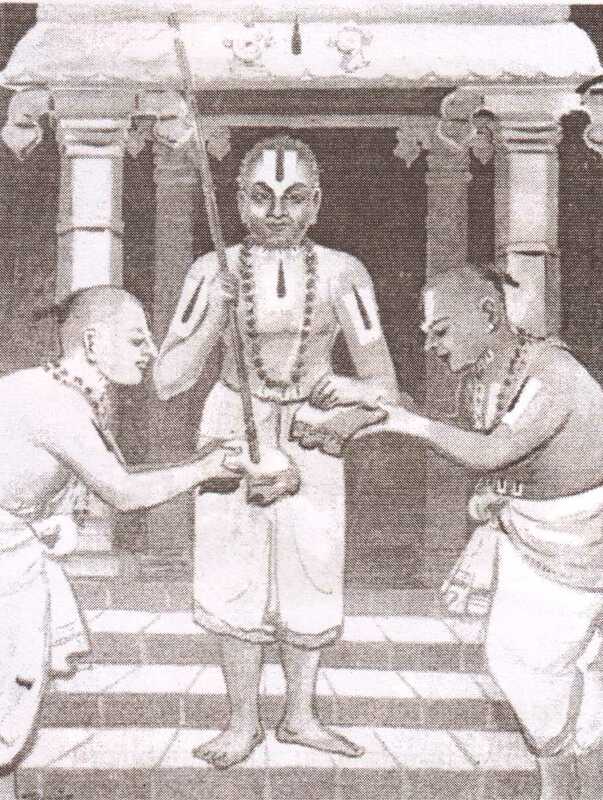 nAyanAr accepts sannyAsAsramam and srI ranganAthan gives him the name azhagiya maNavALa mAmunigaL (insisting that mAmunigaL keeps the same name as himself – azhagiya maNavALan is one of the cherished names of srI ranganAthan). emperumAn asks him to have pallavarAyan mutt (which is a historical mutt from emperumAnAr‘s times) as his residence and live in srIrangam until he ascends to paramapadham just like he ordered emperumAnAr to do so. mAmunigaL instructs ponnadikkAl jIyar and other sishyas to renovate the mutt and builds a hall for his regular kAlakshEpams (lectures). While building the hall, he builds with the soil retrieved from piLLai lOkAchAryar‘s residence – as piLLai lOkAchAryar was the pioneer in documenting the rahasya arthams (confidential principles). mAmunigaL spends his time fully on re-establishing the sath sampradhAyam principles since during the previous generations there were lots of turbulence in srIrangam due to invaders attacking the town and destroying people and literature. 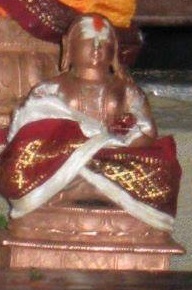 Hearing his glories and benevolence, many people approach mAmunigaL and become his sishyas. Once mAmunigaL blesses AychiyAr who is the daughter of thirumanjanam appA. AychiyAr being greatly devoted to mAmunigaL (who is the AchArya of her father), requests mAmunigaL to accept her as his disciple. mAmunigaL initially hesitates but later accepts her as his disciple seeing AychiyAr’s total dedication. She does not reveal this to anyone including her husband kandhAdai siRRaNNar. She stays at her father’s residence for some time. At that time kOil aNNan’s father’s srArdhdham occurs where she is requested to cook for the occassion. She performs that kainkaryam with a pure attitude and after the srArdham is completed everyone is resting at the porch (near entrance). At that time, kOil aNNan notices a srIvaishNava coming from periya jIyar‘s (mAmunigaL) mutt. aNNan enquires the wherabouts and the purpose of his visit. The srIvaishNava mentions that his name is singaraiyyar he is from vaLLuva rAjEndhram (near by village) and he has come to become the disciple of mAmunigaL but his desire is yet not fulfilled. aNNan says to him that there are many AchAryas in srIrangam and he can become a sishya of any one. The srIvaishNava replies that it is per the order of bhagavAn himself that he becomes a sishya of mAmunigaL. aNNan becomes astonished and wants to know more, but singaraiyyar says its confidential and wont reveal the details yet. aNNan invites him inside to accept prasAdham and thAmbUlam and asks him to rest there for the night. In the night when aNNan and his brothers were lying outside, AychiyAr who is inside the house, lies down to go to sleep. She says “jIyar thiruvadigaLE charaNam, piLLai thiruvadigaLE charaNam, vAzhi ulagAsiriyan” (salutations to mAmunigaL, thiruvAimozhi piLLai and piLLai lOkAchAryar). aNNan and his brothers hear this and one of them go inside to find out the matter. But aNNan and appan retains him and says we can check in the morning. aNNan becomes reverential towards mAmunigaL and could not sleep. He goes back to singaraiyyar and enquires in the night. singariyyar explains a long incident – I periodically collect vegetables, etc from my village and submit them to the mutts/thirumALigais of AchAryas. Once, a srIvaishNava instructed me to submit this to periya jIyar mutt. I considered it a great fortune and went to jIyar mutt with the vegetables. jIyar asked me many questions such as where did these grow?, who watered them?, etc. I humbly replied to him that these were grown in pure lands and were nurtured by his sishyas only. periya jIyar became happy hearing that and accepted the vegetables. He also instructed me to go to periya perumAL and worship him before leaving. The archakar (priest) enquired me about the vegetables and to whom I offered them this time. I replied to him that they were submitted to periya jIyar mutt. The archakar became very happy hearing that and told me that I am most fortunate and I am going to get great AchArya sambandham. He also blessed me and gave thIrtham (charaNamritham – holy water), srI satagOpam, garland, abhaya hastham, etc and I felt very blessed. I returned to jIyar mutt and informed periya jIyar that periya perumAL greatly blessed me by your grace and informed him that I am returning. The kainkaryaparars (servitors) in the mutt gave me some prasAdham and I had it on my way and that purified my consciousness greatly. In the night I saw a dream. I was in periya perumAL‘s sannidhi. periya perumAL pointed towards Adhi sEshan and told me “azhagiya maNavALa jIyar is the same as Adhi sEsha. You become his sishya”. From that time onwards, I am waiting to become the sishya of mAmunigaL. Hearing these incidents, aNNan starts deep contemplation and goes to sleep. aNNan sees a dream during his sleep. A srIvaishNava steps down from upstairs with a whip on his hand and starts giving lashes to aNNan. aNNan, even though had the power to stop him, does not do so and understands that the srIvaishNava is punishing him for his wrong-doings. The whip broke after a while and the srIvaishNava pulls aNNan by his hand. aNNan asks what to do and the srIvaishNava instructs aNNan to go upstairs. Both aNNan and the srIvaishNava climbs up. There he observed a sannyAsi who looked very angry and he too started giving lashes to aNNan and finally that whip breaks too. The srIvaishNava prays to the sannyAsi and tells him “He is a small boy and does not know what he is doing, please stop the beatings and bless him now”. The sannyAsi then takes aNNan and keeps him on his lap and affectionately speaks to him. He says “Both you and uththama nambi committed offenses”. aNNan replies “I did not truly understand the glories of azhagiya maNavALa jIyar and became confused – please forgive me now”. The sannyAsi replies affectionately “I am bhAshyakArar (srI rAmAnuja) and this srIvaishNava is mudhaliyANdAn (your ancestor). You reform yourself and dont misuse the relationship with mudhaliyANdAn. I am Adhi sEshan and have come again as maNavALa mAmunigaL. You and your relatives become the disciple of mAmunigaL and be uplifted”. The dream stops and aNNan wakes with shock and awe. He explains the incidents to his brothers with great emotions. He goes to AychiyAr who is sleeping inside and informs her about the dream. She also informs him about how mAmunigaL purified her and blessed her with divine knowledge. He becomes happy to hear about it and returns to singaraiyyar and informs him about the dream to. Then he goes to cauvery river and performs his daily anushtAnams. He then returns to this residence and invites uththama nambi and many other kandhAdai family members (descendants of mudhaliyANdAn). Many arrive at his residence and they are all surprised to hear that every one saw the same dream. They all go to embA who is the grandson of a famous AchArya lakshmaNAchAryar. embA becomes angry hearing about the dream and tells them that it is not befitting for their family background to go an take shelter of another jIyar. A few others also same the same and does not want to take shelter of periya jIyar. aNNan along with many other kandhAdai family AchArya purushas go to jIyar mutt to take shelter of mAmunigaL. aNNan takes the help of his own sishya thiruvAzhiyAzhwAr and mAmunigaL’s dear sishya sudhdha saththvam aNNan to approach mAmunigaL. sudhdha sathvam aNNan used to often explain the glories of mAmunigaL to kOil aNNan. So, kOil aNNan takes the help of him to approach mAmunigaL. kOil aNNan then goes to mAmunigaL’s mutt along with many of his family members. mAmunigaL is giving a lecture at thirumalai AzhwAr maNdapam. aNNan, not wanting to disturb mAmunigaL, informs AychiyAr about their arrival and AychiyAr sends a srIvaishNava inside to let mAmunigaL know about their arrival at the right time. That srIvaishNava misunderstands the intentions of kOil aNNan and his family members and informs to mAmunigaL in the wrong sense (as if they are coming for a debate/argument or something). mAmunigaL, not wanting to cause any confusion, leaves to the backside of the mutt. In the mean time, aNNan and his relatives approach vAnamAmalai jIyar and offers their respects to him. AychiyAr following the srIvaishNavar to find out what happened explains the intentions of kOil aNNan to mAmunigaL. mAmunigaL then chastises the srIvaishNavar and welcomes kOil aNNan and his relatives with great respect. kOil aNNan and his relatives fall at his lotus feet, offers prayers and glorifications to periya jIyar and offers fruits, etc. mAmunigaL gives a short lecture on thiruppallANdu and poliga poliga padhigam (decade) in thiruvAimozhi briefly. aNNan requests mAmunigaL through ponnadikkAl jIyar to acknowledge them and accept them all as his disciples. mAmunigaL at once goes inside to a private place and invites aNNan inside through ponnadikkAl jIyar. mAmuniaL asks aNNan “You already belong to vAdhula clan (of mudhaliyANdAn) which is already well established and an AchArya purusha family. Why is this (becoming my sishya) required?”. aNNan insists that he needs to be accepted, asking forgiveness for his previous state of not giving proper respect to mAmunigaL and explaining the divine dreams. mAmunigaL accepts the request and tells aNNan that there are few other fortunate souls who would be directed by emperumAn through their dreams and instructs that every one assemble after 3 days for the pancha samskAram. aNNan happily accepts the proposal and leaves along with his relatives. emperumAn appears in the dreams of many others and breaking the shackles of archA samAdhi (his own vow of “not interacting” with anyone in archAvathAram/deity form) instructs that mAmunigaL is non-different from bhagavAn himself and everyone should take shelter of his lotus feet to be uplifted. After 3 days, everyone assembles at periya jIyar mutt. aNNan, without any pride about his family heritage and fully wanting to become surrendered to mAmunigaL, goes to mAmunigaL and requests him to perform pancha samskAram to everyone. mAmunigaL instructs vAnamAmalai (ponnadikkAl) jIyar to prepare the necessary aspects and performs pancha samskAram (thApam – shanka/chakram imprint on the shoulders, puNdra – Urdhva puNdram, nAma – giving a dhAsya nAmam (name), manthra – the rahasya thraya manthrams and yAga – thiruvArAdhanam procedure) to kOil aNNan and divinely blesses him. Immediately, mAmunigaL thinks about ponnadikkAl jIyar and points towards him and announces in the big assembly “ponnadikkAl jIyar is like my life breath and well wisher. Whatever glories I have, he should also get the same”. aNNan understands mAmunigaL’s emotions and says “You should have made me a disciple of ponnadikkAl jIyar” and mAmunigaL shows his special attachment towards aNNan saying “How can I give up some one who is destined to me (by the divine orders of periya perumAL himself)?”. AychiyAr’s son appAchiyAraNNA then raises and requests mAmunigaL to make him a disciple of ponnadikkAl jIyar. mAmunigaL becomes very pleased and hails him as “nam appAchiyAraNNAvO?” (Is this our appAchiyAraNNA?). mAmunigaL then seats ponnadikkAl jIyar in his own simhAsanam (throne) and forcefully places the shankam and chakram in his hands and asks him to perform pancha samskAram to appAchiyAraNNA. ponnadikkAl jIyar at first humbly refuses, but mAmunigaL insists him to do it as it will be very pleasing for him. After appAchiyAraNNA, his brother dhAsrathi appai also becomes a sishya of ponnadikkAl jIyar. ponnadikkAl jIyar, out of humility withdraws from the Asanam (seat) and offers his praNAmams to mAmunigaL out of great respect. After that, aNNan’s brother kandhAdai appan and many others become sishyas of mAmunigaL. At that time, periya perumAL‘s prasAdham arrives and mAmunigaL accepts the same with great reverence. Everyone then goes to the temple and performs mangaLAsAsanam and returns to the mutt for a grand thadhIyArAdhanam. One day, mAmunigaL hails the attachment of sudhdha sathvam aNNan towards kOil aNNan. He also instructs ANda perumAL (who is a great scholar coming in the family lineage of komANdUr iLayavilli AchAn) to become the sishya of aNNan and fully serve aNNan in spreading the sath sampradhAyam. eRumbi appA who is a relative of kOil aNNan, approaches mAmunigaL through the purushakAram (recommendation) of kOil aNNan and becomes a dear disciple of mAmunigaL. kandhAdai nAyan (who is the son of kandhAdai aNNan) was most intelligent and knoweldgable even at an young age. When mAmunigaL was explaining some meanings from dhivya prabhandha pAsurams, kandhAdai nAyan nicely gives an interpretation. mAmunigaL lifts him up and places him on his lap and greatly glorifies him and blesses him to be a leader of our sampradhAyam. kandhAdai nAyan is the author of periya thirumudi adaivu. prathivAdhi bhayankaram aNNan approaches mAmunigaL and becomes his sishya. He too first visits kOil aNNan’s thirumALigai first and had great respect for each other. mAmunigaL instructs kOil aNNan to explain bhagavath vishayam to kandhAdai appan, thirukkOpuraththu nAyanAr bhattar, sudhdhasathvam aNNan, ANda perumAL nAyanAr and ayyanappA and gives him the title “bhagavath sambandha AchAryar” and makes him the main AchArya for bhagavath vishayam. Once, mAmunigaL observes kandhAdai nAyan (son of aNNan) and jIyar nAyanAr (mAmunigaL’s own grand-son from his pUrvAsramam) discussing bhagavath vishayam in a detailed manner and instructs them to write an arumpadham (detailed explanation) in samskritham for eedu vyAkyAnam. After mAmunigaL performing bhagavath vishaya kAlakshEpam in srIrangam in front of srI ranganAthan, emperumAn himself appears on the final day of Ani thirumUlam, submits the “srIsailEsa dhayApAthram” thanian and accepts mAmunigaL as his AchAryan. Immediately emperumAn instructs to all dhivyadhEsams that this thanian be recited as part of daily routines in the beginning and in the end. At the same time, in kOil aNNan’s thirumALigai (residence), aNNan’s wife and other srIvaishNavis are discussing about mAmunigaL’s glories. A small boy arrives there and submits a chit with the same thanian and vanises. Every one understands this to be a divine act of emperumAn. Once, mAmunigaL asks kOil aNNan if we wants to go and perform mangaLAsAsanam to thiruvEnkatamudaiyAn. At that time, appiLLai glorifies aNNan as “kAvEri kadavAtha kandhAdai aNNananRO” (one who does not cross the river cauvery – one who never leaves srIrangam). 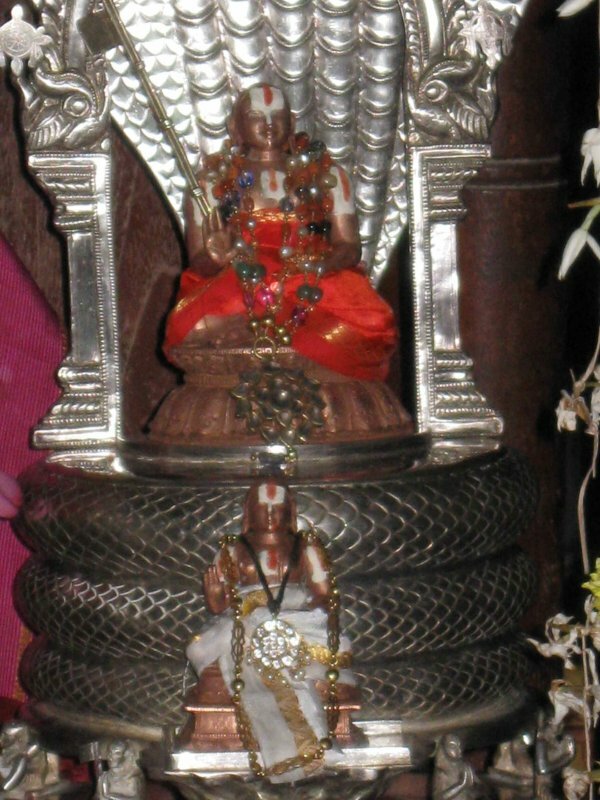 But mAmunigaL highlights that srI ranganAthan stays at the top of the thirumalai being worshipped by nithyasUris. aNNan becomes very pleased and asks permission from mAmunigaL to go for thirumalai yAthrai. mAmunigaL brings him to periya perumAL sannidhi and gets his permission/blessings to leave and sends uththama nambi (dear kainkaryaparar of periya perumAL) along with aNNan. aNNan is accompanied by many srIvaishNavas. When offered a palanquin, aNNan rejects that and he walks along with the srIvaishNavas manifesting great humility. Once he reaches the foot-hills of thirumalai, ananthAzhwAn (servitor of thiruvEnkatamudaiyAn coming in the family lineage of thirumalai ananthAzhwAn), periya kELvi jIyar, AchArya purushas and many srIvaishNavas welcome aNNan and the srIvaishNavas with great pomp. aNNan participates in the rathOthsavam and performs mangaLAsAsanam to emperumAn. He meets ayOdhya rAmAnuja aiyyangAr who was serving in srI bhadhrikAsramam. ayOdhyA rAmAnuja aiyyangAr wants to take shelter of mAmunigaL, but ananthAzhwAn explains that aiyyangAr should take shelter of aNNan which will be more pleasing to mAmunigaL. aiyyangAr happily obliges and requests aNNan to accept him as his disciple. aNNan accepts his request and performs pancha samskAram to aiyyangAr. thiruvEnkamudaiyAn acknowledging aiyyangAr’s relationship with aNNan, declares that he will be known as “kandhAdai rAmAnuja aiyyangAr”. kandhAdai rAmAnuja aiyyangAr goes on to perform many notable kainkaryams. aNNan decides to return to srIrangam and goes to thiruvEnkatamudaiyAn to seek for permission to leave. emperumAn gives his own vasthram to aNNan and aNNan happily accepts the same. emperumAn also instructs aNNan to return in the palanquin submitted by kandhAdai rAmAnuja aiyyangAr and returns to srIrangam. On the way, he performs mangaLAsAsanam to many dhivyadhEsams and also visits eRumbi appA and his elders at eRumbi. At kAnchIpuram, aNNan desires to bring water from sAlaikkiNaRu (well from which emperumAnAr brought water for dhEva perumAL’s kainkaryam). aNNan happily performs this kainkaryam and instructs appAchiyAraNNA to continue this kainkaryam. aNNan plans to leave kAnchIpuram to go to srIperumbUthUr and other near by dhivyadhEsams. He goes to dhEva perumAL to seek his permission to leave. At that time dhEva perumAL was enjoying thiruvArAdhanam. After thaLigai (bhOgam) is offered to dhEva perumAL, dhEva perumAL invites aNNan to the front and blesses him with his vasthrams, garlands, sandal wood and fragrance applied to him, etc and gives them to aNNan saying that all these for for periya jIyar and gives him a nice farewell. aNNan comes out and seated across kachchikku vAyththAn maNdapam and starts lecturing mAmuigaL’s glories. A few elders highlight dhEva perumAL himself saying mAmunigaL as “aNNan jIyar” (kOil aNNan’s AchAryan mAmunigaL) and glorify that very much. They also remind him how periya perumAL identified kOil aNNan as “jIyar aNNan” (periya jIyar‘s sishya kOil aNNan). At that time, a message comes from mAmunigaL to return to srIrangam since it had been long since he left. kOil aNNan at once accepts that invitation from his AchArya, offers his praNAmams towards the direction of srIperumbUthUr and other dhivyadhEsams and returns to srIrangam. periya jIyar arrives at kOil aNNan’s residence and thirumAlai thantha perumAL bhattar arrives along with temple kainkaryaparars with periya perumAL‘s garlands and prasAdham. Every one welcomes aNNan with great delight and mAmunigaL fully blesses aNNan on his arrival. The srIvaishNavas mention to mAmunigaL that dhEva perumAL glorified him as “aNNan jIyar”. mAmunigaL becomes very pleased hearing that and says that he was blessed to have such connection with aNNan. prathivAdhi bhayankaram aNNan highlights that aNNan jIyar sounds similar to sriya:pathi – just like both emperumAn and pirAtti enhance each others glories, kOil aNNan and mAmunigaL enhance each others glories too. Towards the end of his time in this world, mAmunigaL was writing the vyAkyAnam for AchArya hrudhayam with great personal discomfort. When aNNan goes and asks mAmunigaL why he was putting himself under so much trouble, mAmunigaL magnanimously replies that he is writing these commentaries for the benefit of his sons and grandsons (future generations to come). mAmunigaL was instrumental in re-establishing the rights and privileges for kOil aNNan which were lost during the bad times of srIrangam when the invaders destroyed everything. eRumbi appA (another sishya of mAmunigaL) highlights a beautiful incident in his pUrva dhinacharyA (a divine grantham narrating the daily activities of mAmunigaL) slOkam 4. Simple translation: eRumbi appA to mAmunigaL – “Your highness is having your two dear sishyas (kOil aNNan and kOil appan) on either side and holding on to them tightly with your lotus like tender hands and walking with your tender (lotus) feet on mEdhinI (earth)”. For a sannyAsi who is fully realised – if he does not carry his thridhaNdam for some reason – there is no defect. A sannyAsi who is in constant meditation of bhagavAn, who is well-behaved and who has properly heard the meanings of sAsthram from his AchAryas, one who is knowledgable in bhagavAth vishayam and one who has control over his own senses and the whole world – for such sannyAsis their thridhaNdam, etc., are not required. When prostrating before emperumAn fully, since the thridhaNdam may be a hinderance to perform such full prostration, he may not carry the thridhaNdam at that time. Simple translation: If one takes shelter of kOil kandhAdai aNNan (who is most popular due to his merciful nature), whatever may be his qualities, creed or nature – he will become my master at once. Thus, we have seen some glimpses of the glorious life of kOil kandhAdai aNNan. He was very dear to mAmunigaL. Let us pray at his lotus feet that we too get a little bit of such abhimAnam of AchAryan. This entry was posted in other AchAryas on October 16, 2013 by sarathyt. Mamunigalukum Annanukum undana sambanthame ungal pathipil melongi irukirathu. Nanri. Would have been better if you could have explained how varadhanarayanan become ANNAN, Kal thotti prasadam being offered i thirumaligai, Affection of Annan towards arangan (Aranganai kanatha kannai sunnambum elumichayum kondu posukalam…ithyathi), Ponnadiyam sengamala pothugal enru, mamunigalin thiruptha kuradugal inrum thirumaligayil sishyargaluku sathikka perugirathu etc…. thanks for the feedback. adiyen compiled this mostly based on yathIndhra pravaNa prabhAvam. if there is more information, pls share (if there is grantham which adiyen can refer to – pls refer that too). AchArya sambandham is the most important aspect and was cherished by pUrvAchAryas very much – that being more in this article is a divine arrangement and based on the pramANams which exist. Thanks. It’s really a great article. My feedback was not based on pramanams but based on the preachings of varthamana annan swami and vaikundavasiyana srinivasachariar swamy. We will speak in detail when we meet in person. sure swamy – adiyen neither being a kOil aNNan sishya nor had any close association with such sishyas – adiyen does not more about kOil aNNan’s vaibhavams beyond what is seen in existing works. adiyen would be delighted to know more about his vaibhavams and we can certainly discuss more in person – looking forward to that. Parangusa pancha vimshati which consits of 25 slokams , even now recited as goshti in srirangam azhwar purappadu during adhyana uthsavam , is not written by kovil annan himself. but by his grand son also named as kovil annan wrote it .. I am delighted to see the in depth presentation of Shri Koil Annan Swamigal. I am having a small 14 page PDF file of “Koil Annan Thirumaligai Saarrumurai Kramam” in Tamil and I am eager to share the same to you. If it can be appended below, your article for Sishyas who are keen to chant them, it will be of immense value. Kindly Consider. Respected sir, I have acquired a recent interest and googling some terms landed me at your blog for which I am very grateful. I have been greatly enjoying learning about Guru Paramparai. This post has me very interested as I bear the surname “Kandhadai” and belong to Vadhula Gothram as well. I would be very interested in knowing if I belong to this lineage. Is there some way to find out? Glad to hear about the interest and the learning. Certainly, if you have kandhAdai in your surname and belong to vAdhUla gOthram, you would be a descendant of mudhaliyANdAn, direct Sishya of emperumAnAr and the previous ancestor of kOyil kandhAdai aNNan.